We don't know how we missed this piece of news yesterday, but The Fanhouse has the scoop: They're bringing back Tecmo Bowl! 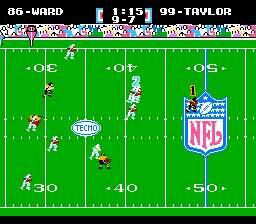 Picture a night of Tecmo Bowl with your friends right now. You'd put the game in, and for about 30 seconds, you'd be a giddy young buck. Within a couple of minutes, though, you'll say to yourself, "Really, this is it? I run in zig-zags and have just two different buttons to press?" Then one guy will leave because he has to go clean out his gutters or his wife will leave him, and another guy will pass out behind the couch because this is the one night of the month he's allowed to drink and he overdid it. From there, another friend will ask if he can turn the game off and watch Grey's Anatomy, and the one guy who does want to play, the unemployed stoner who has played Tecmo Bowl for three hours every day since 1988, will call you a sissy because you're saying this whole thing was a bad idea. It's sad, but so true. By the way, if you're not reading MJD's new daily Debriefing column over there, you're missing out on one of the most beautiful parts of the American Dream.